Celebrating its 152th birthday in 2009, this historic Victorian seaside gem is the oldest resort and one of the most beautiful spots in the country. The entire city is a National Historic District, with nearly 600 preserved Victorian buildings. The natural beauty of the southernmost beach in the state has been a draw for centuries. A lovely promenade runs along the sand, perfect for biking or jogging. On Sunset Beach, you can search for Cape May Diamonds (polished quartz that washes up on shore). 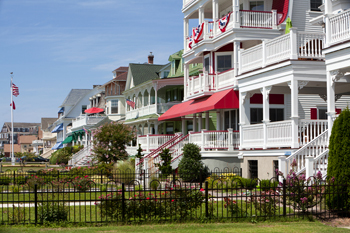 Cape May Historic District / Mid-Atlantic Center for the Arts Trolley and walking tours (guided & self-guided), Emlen Physick Estate, Cape May's only Victorian House Museum, the restored 1859 Cape May Lighthouse and the restored World War II lookout tower. Cape May Lighthouse Visitors who climb the 199 steps to the top of the lighthouse are rewarded with a spectacular panoramic view of the scenic Cape May peninsula. For additional information on lighthouse tours, hours of operation call The Mid Atlantic Center for the Arts at (609) 884-5404. Admission is $7 for adults and $3 for children 12 and under.